In the General Assembly during this time of year, "March Madness" refers to more than just a basketball tournament as the final hectic days of the legislative session draw to a close. As we wrap up the fiftieth legislative day, the Senate continues to build on our body of work by passing bills addressing domestic violence, education, drug use and treatment, and government efficiencies. Eric Daugherty had one question for the hundreds of people gathered in the St. Augustine School gymnasium Saturday afternoon. "Are y'all ready to see some hair hit the floor?" he asked. Their enthusiastic cheering said they were. After Saturday's event, seven hair stylists had shaved more than 100 heads, leaving a sizable pile of hair on the floor. And that's not counting the 10 heads that were shaved at Big Jim's Friday night. 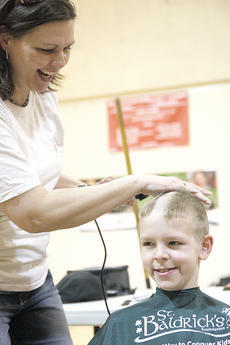 This was the fourth year for the local St. Baldrick's event and the 10th year events have been held across the nation. The 2010 Census forms should be arriving soon. In fact, by the time you read this, some of you may have already received your forms. I hope you will take the time to fill out this year's form, which has just 10 questions. If there is more than one person in your household, some questions will need to be answered more than once. Rest assured that the questions are simple, and the form shouldn't take much time to fill out. When it comes to education, few days in recent years could rival last Thursday, when the state learned in the morning that it is a "Race to the Top" finalist and the Kentucky House voted overwhelmingly that afternoon to begin raising the high school drop-out age from 16 to 18. Even before the House of Representatives passed its $17.5 billion budget proposal, the Senate Appropriations and Revenue Committee had our first meeting to discuss some of the tax measures that affect business. I am very concerned that these measures will hinder job creation. In the committee, I heard testimony from 10 business representatives who discussed how taxing businesses, including farms, which are already struggling would have a negative impact on employment. After nearly two months of work, and in the face of a $1.2 billion deficit, the Kentucky House of Representatives voted this past week for a two-year budget that streamlines state government while investing in the Commonwealth. Legislators have known for months that the budget would be difficult to write, given the nation's worst economic crisis since the Great Depression. Wednesday of last week, the Marion County High School girls' basketball team made its first appearance in the Sweet 16 since 1995. This year's Lady Knights did something that has only been done a handful of times in the history of MCHS. 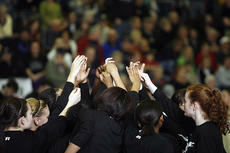 They won regional and district championships, and they finished the season 33-2, an outstanding mark, by any standard. With less than 21 legislative days of the 2010 General Assembly Session remaining, the Senate continues to address a wide variety of issues as we await the House of Representatives to wrap up work on their budget proposal. This week, the Senate passed legislation that will strengthen government ethics, help the Department of Education better classify school buildings, and protect our children from a new hallucinogenic drug. Monday, letters were sent to The Lebanon Enterprise and The Casey County News by the two candidates who had filed to run in the Republican primary May 18. Bill Pikerill announced that he is withdrawing from the race for the 24th District state representative seat. That leaves Leo Johnson as the only Republican candidate remaining. What follows are the letters submitted by Pickerill and Johnson. It is with deep regret that I announce today that I am ending my candidacy and I am withdrawing my name for the House of Representative's 24th District. The State Senate dealt with a wide-ranging legislation this week addressing issues such as teaching the Bible in schools, cutting red-tape for businesses, reducing jail costs for counties, and helping severely emotionally-challenged children. The United States' legal system is based, in part, on the Judeo-Christian tradition. The Bible is a rich source of history, sociology, and literature. Senate Bill 142 requires the Department of Education to formulate guidelines for public schools to teach the Bible as an elective social studies course. Last week, as House leaders continued working on the final details of a budget plan that should be ready soon for a vote, the spotlight fell on our Judiciary Committee. The window in the front hallway of Lebanon Middle School is covered with paper chains. Each chain contains a sentiment, a prayer or a wish for the well-being for the Haitian people. In light of the massive earthquake that hit Haiti in January, the LMS STLP and BETA clubs proposed selling the paper chains for a quarter each, according to Bethany Purdom, a student at LMS. Every quarter raised went toward the purchase of healthy mixes of rice and vegetables that could provide six meals per bag. The lives of Kentucky veterans will improve thanks to legislation passed this session by the Kentucky House of Representatives. In the bull riding arena, that brief amount of time is considered the most dangerous in sports. But, in the basketball arena, it carries with it different meaning for me. It's the amount of time this self-professed benchwarmer played at the Sweet Sixteen in 1995 when the Lady Knights lost in the quarterfinals to Pulaski County. We are now halfway through the 2010 General Assembly Session and while the House of Representatives continues to labor, as constitutionally required, on a budget proposal, the Senate's work, while on a smaller scale, is no less important. Both House and Senate Appropriations and Revenue chairmen are in close consultation so that when the House budget proposal is finalized and moves to the Senate, we can hit the ground running. Since 1926, February has been deemed Black History Month. In this month, the world celebrates the lives, inventions, and accomplishments of black people. If I may be honest, it is a shame that it took the world so long to realize that people of color had brains and talent that exceeded dancing, singing and dunking a basketball. I had considered calling this column "making sausage" because of something I heard years ago: that passing legislation is like making sausage since you don't really want to see how it's made. Although to be fair, I've heard the same analogy applied to putting together a newspaper. Whether its officials meant for it to become this way or not, topix.com has become the source of countless complaints from people all over the country, including here in Marion County. From time to time, someone will call our office either demanding that we remove something from the discussion board or trying to find out how to do so.